Even 2016 had a silver lining or two. 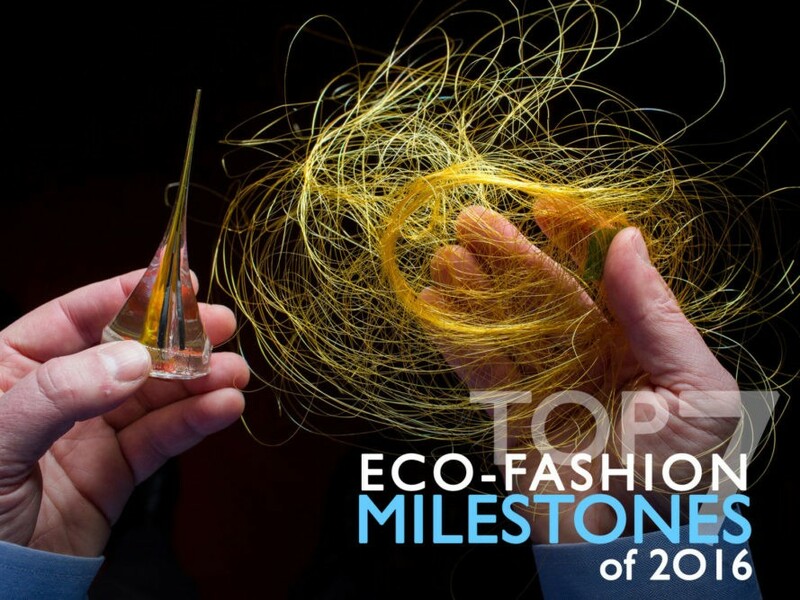 From the Armani Group eradicating fur across all its brands, including Giorgio Armani, Emporio Armani, and A/X Armani Exchange, to Adidas to committing to making 1 million pairs of sneakers out of recycled ocean plastic, here are seven milestones that redeemed one stinker of a year. Above, the establishment of the the eighth Manufacturing Innovation Institute, a broad coalition of manufacturers, universities, and nonprofits that will draw upon more than $250 million in public-private investments, plus $75 million in federal resources, over the next five years, to accelerate textiles innovation in the United States. Why is everyone obsessed with plastic and welding? Don't you know it creates emissions every time you do it? Fix a faulty zipper? Or patch up a rip in a jacket? If you live in Sweden, these simple acts of repair could result in a lower tax bill. In a bid to reduce materials consumption, the country’s ruling Social Democrat and Green party coalition has proposed tax breaks on repairs for everything from bicycles to footwear. In plans drawn up for the fall budget, Swedish officials suggested dropping, from 25 percent to 12 percent, the value-added tax on getting these items fixed. A second proposal will allow Swedes to claim back on their income tax up to half the labor costs of fixing appliances such as washing machines, fridges, dishwashers, and stoves. G-Star Raw, Ted Baker, Haikure, and Vivobarefoot are going public—with their sustainability scores, that is. The four brands are part of a pilot program with Made-By, a European not-for-profit dedicated to improving environmental and social conditions within the fashion industry. After a year of working with "Mode Tracker," a roadmap-progress tool designed to engage brands and retailers in a wide range of sustainability issues, the companies are ready to lay bare the successes and challenges of verifying—and ultimately improving—their supply chains. Levi Strauss has teamed up with Evrnu, a Seattle-based startup that reconstitutes old fibers into new, to create the world's first jeans made up of more than 50 percent post-consumer cotton waste. The two companies created the prototype, a pair of Levi's 511s, using five used cotton T-shirts and a technique that Evrnu says consumes 98 percent less water than those associated with virgin-cotton products. The jeans, according to Evrnu CEO Stacy Flynn, provide a glimpse of a future where textiles are regenerated not just once but multiple times, paring down waste. In a move that animal-rights groups are hailing as historic, the Armani Group has committed to eliminating the use of fur in its collections across all brands, including Giorgio Armani, Emporio Armani, and A/X Armani Exchange. "Technical progress made over the years allows us to have valid alternatives at our disposal that render the use of cruel practices unnecessary as regards animals,” Giorgio Armani, the Italian company's namesake founder, said in a statement released by the Fur-Free Alliance. The world's first sneaker made from recycled ocean plastic is headed for the production line. First teased in 2015, the Adidas x Parley for the Oceans Ultra Boost Uncaged is graduating from a limited run of 50 to 1 million pairs by 2017, the sportswear manufacturer said. In fact, the first mass-manufactured lot—all 7,000 pairs of them—dropped last month, along with soccer jerseys for the sports clubs Bayern Munich and Real Madrid. Like the shoes, the jerseys will incorporate upcycled marine waste collected by Parley's clean-up operations in the Maldives, a string of 1,000 coral islands off India's western coast.